I participated in an Influencer Activation on behalf of Influence Central for Weleda. I received product samples to facilitate my review as well as a promotional item to thank me for my participation. All opinions and reviews are my own. Does your baby have sensitive skin? Peanut has been showing signs of sensitivities lately. Maybe it was the cold of the winter or now with pollen season in full swing. I'm not sure. I want his skin to stay baby soft without irritation. I have been a fan of Weleda baby products for a while. Weleda has been developing plant-based medicines and natural cosmetic products since 1921 with a focus on quality, from the selection of raw materials to the finished holistic product. So when I was sent Weleda's NEW Baby Derma White Mallow Collection to review, I was very excited. Being 100% certified natural by the European association NaTrue, the products were awarded the esteemed National Eczema Association Seal of Acceptance. Weleda’s Baby Derma White Mallow Collection provides natural skin care products for your baby that are dermatologically tested, fragrance-free that both soothe and nourish their skin as well as mitigates symptoms of eczema and sensitive skin. Peanut LOVES bath time. This is an understatement. I have to bathe him almost nightly anyways because he is a messy boy, but nightly baths can be rough on baby's soft skin. 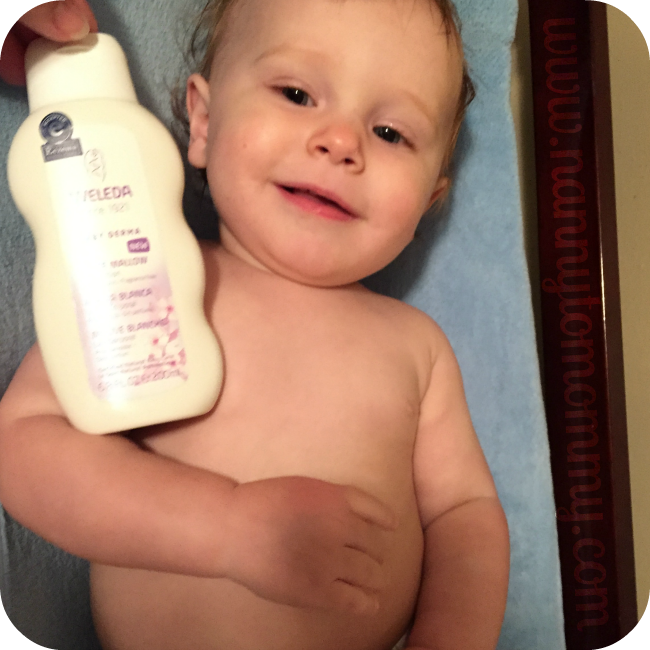 I try not to use soap when I don't have to, but I have also been using Weleda's new White Mallow Baby Lotion, which is 95% organic, as part of his night time routine and I have noticed a difference. He was having red random splotches on his skin that were kind of rough and dry, but not since the change. The Baby Derma White Mallow Collection harnesses the power of organic white mallow extract, pansy extract, coconut oil, borage seed oil and sweet almond oil to calm irritated skin and strengthen its natural protective barrier. These key ingredients have long been used in homeopathy to treat childhood eczema. The scent is light and refreshing because it comes from natural ingredients. He also had bad diaper rash a few nights ago. Hubby put the kiddos to bed for me (because I wasn't feeling well) and he forgot to change Peanut's diaper. Peanut woke up crying early that morning and had a dirty diaper that had been there a while. But we have been using Weleda's Baby Derma White Mallow Diaper Rash Cream, which is 86% organic, and it has cleared it right up. I feel that it gives him soothing relief as well because he doesn't mind it when I put it on him. Baby Derma White Mallow Diaper Rash Cream effectively relieves and prevents diaper rash with pharmaceutical-grade zinc oxide and extracts of white mallow, long known for its soothing and healing properties. It is now a diaper bag staple. Although the products are ideal for children (newborn and up) with highly sensitive or atopic skin, as well as babies born into families with a history of highly sensitive skin, like mine. They are also suitable and effective for adults with atopic skin. I have been using the White Mallow Face Cream, which is 97% organic, on my skin. I have been using it on my problem areas and it has really helped clear up my sensitive dry spots, like my hands and arms. Weleda products are available at Whole Foods Market, select natural health food stores, buybuyBaby and at www.usa.weleda.com. And until 6/30/15, you can use promo code WELEDABABY for 20% off of your next Weleda product purchase on www.usa.weleda.com. Does your little one suffer from eczema or sensitive skin? What do you think of Weleda Baby products? What do you think of their new Baby Derma White Mallow Collection? That sounds lovely! I will need to keep these in mind for baby shower gifts. The pictures are great too. Thanks for sharing. I have a friend with children who suffers from eczema. I will direct her to this post so she can decide if these products may help. I have sensitive skin in certain areas myself. I have found that baby products help me a lot. Aww! Great pics! I love that these products are all natural. That definitely makes you feel good about using them on your most precious lil ones. Your picture is SO adorable too! My kiddos both have super sensitive skin and I've tried almost everything on the market! I've never heard of this so I'm gonna order to give it a try. I also have mild eczema so I'll try it on myself as well. As others have said, the pictures are great! What awesome products. Such a cute baby too! My daughter has super sensitive skin and I have to really be mindful of the lotions and other skin products we use. I will have to check this stuff out. Thanks for sharing!